The IAM Local 1943 Community Services Committee makes its annual delivery to the Yellow Ribbon Support Center. From left, Committee Member Jeff Geier and daughter Savannah Geier, YRSC Founder Keith Maupin and Committee Member Andrew Hounshell. 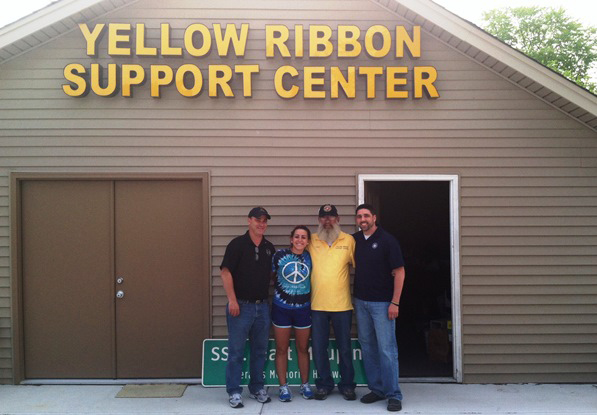 The Community Services Committee of IAM Local 1943 in Middletown, OH marked its fifth year of collecting for the Yellow Ribbon Support Center (YRSC) just in time for Memorial Day. The collection, led by Community Services Committee member Jeff Geier, collects various items to be packed and shipped to those in military service on foreign soil. Items such as snacks, personal care and entertainment are collected throughout locations in the mill at AK Steel and the Local Lodge. In their five years of participation, IAM members at Local 1943 have collected and delivered over five truckloads of goods and $6,000 to the YRSC. 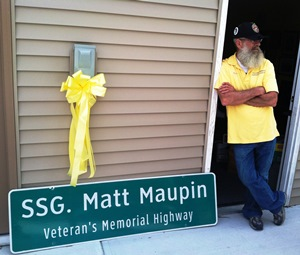 Yellow Ribbon Support Center founder Keith Maupin with the highway sign named for his fallen son. The YRSC, was founded by Keith Maupin of nearby Mt. Caramel, OH in memory of his son, U.S. Army Staff Sgt. Matt Maupin. On April 9, 2004, Maupin was captured in Iraq by al-Qaida insurgents and through relentless pressure from his father, his remains were recovered and returned home. Since that time the elder Maupin has maintained his son’s memory by providing boxes of goodies to our armed forces, and since 2005 the YRSC has sent more than 20,000 care packages to the men and women serving on foreign soil. On May 21, a small contingent of Community Services Committee members delivered the items to Keith Maupin in person. Local 1943 members have developed a close bond with Maupin as a result of their efforts, and Maupin has visited the Local Lodge, spoke to members and addressed the monthly stewards meeting.